Introduced to the public on October 19, 1935, the 1936 Ford was destined to become one of the most popular Fords ever built. 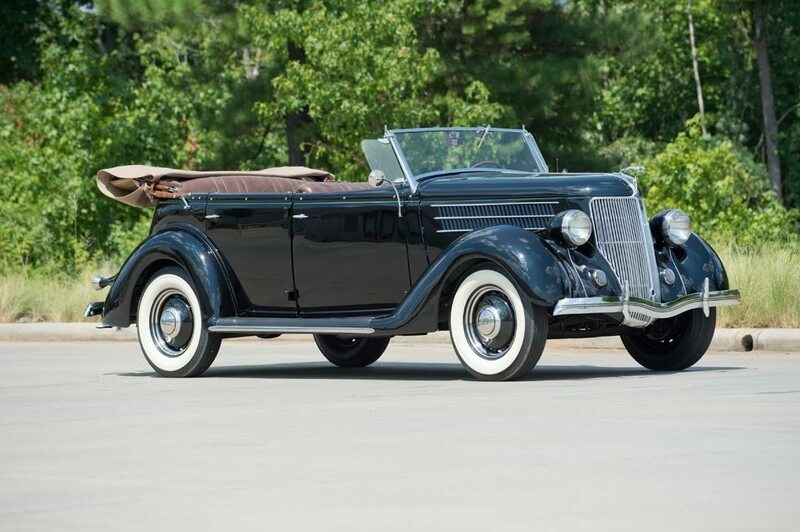 For the second year in a row, Ford sold more than a million cars, and it’s no wonder – with new paint colors, 10 body styles, and the best V-8 engine of the day, buying a 1936 Ford was an easy choice. The beautiful Phaeton harkens back to an elegant time, when open four-person motoring was the norm, and owning a big Deluxe Phaeton meant you had truly arrived. This versatile Phaeton began life as a well cared for daily car that was maintained, driven and paraded for most of its existence. During a detailed restoration, the old school steel was stripped, sanded, dressed in 2-stage paint and accented with small pinstripes. Traditional chrome handles, a tight cloth roof and chrome bumpers complement the lovely bodywork. The Deluxe models such as this include dual chrome mirrors, that distinctive chrome grille, polished side spears, blue dot taillights and a covered rear-mounted spare tire. 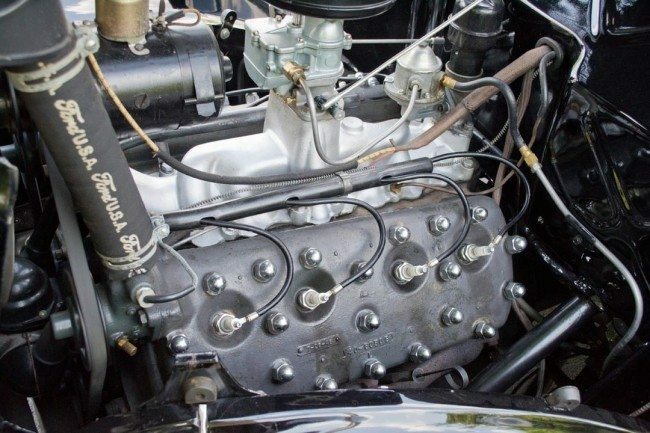 The Ford “flathead” V-8 remains a durable, torque-rich powerplant that, thanks to solid engineering, has an unmatched reputation in the classic car community. In keeping with tradition, this stellar Phaeton is powered by the correct 221 flathead that makes roughly 85 horsepower and sounds fantastic. The antique engine probably looks much better today than when it first growled off the assembly line, with the familiar oiled air cleaner and 2-barrel carburetor above the correct 21-stud heads. Overall, the car’s engine bay is clean, simple and highly functional. Take a look underneath the big 4-passenger open car and you’ll find a damage-free chassis and the car’s clean floors, heavy-duty frame and factory-accurate suspension are all finished in the proper Satin Black skin. A correct 3-speed transmission transfers power to an authentic, banjo-style rear end. In front of that drivetrain, a beam axle and transverse leaf spring remain just as they looked back in 1936. 4-wheel drum brakes do an excellent job of bringing 2,641 pounds of steel to a stop. There’s a traditional, single-pipe exhaust system that, thanks to the correct iron manifold, a factory replacement muffler and a stainless, “V8” branded tip, giving the flathead its unmistakable voice. And everything rides on classy, 16-inch artillery wheels with 6.00-16 BF Goodrich Silvertown whitewalls around stainless trim rings and “V8” branded hubcaps. 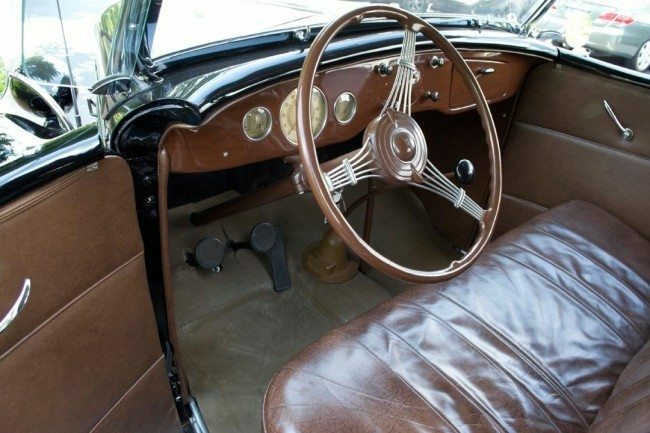 This convertible’s warm and welcoming interior is a look back into pre-war America, complete with supple leather, tasteful use of wood graining and awesome Art Deco gauges. The car’s plush brown cockpit centers on big, heavily bolstered seats that feel soft enough to take a nap on. At the sides of those seats, simple door panels feature polished handles. At the bottom of those panels the traditional, round foot pedals flank an old school shifter and heavy-duty floor mats. Above those pedals, the purposeful dash finds attractive Ford gauges behind a simple array of buttons. 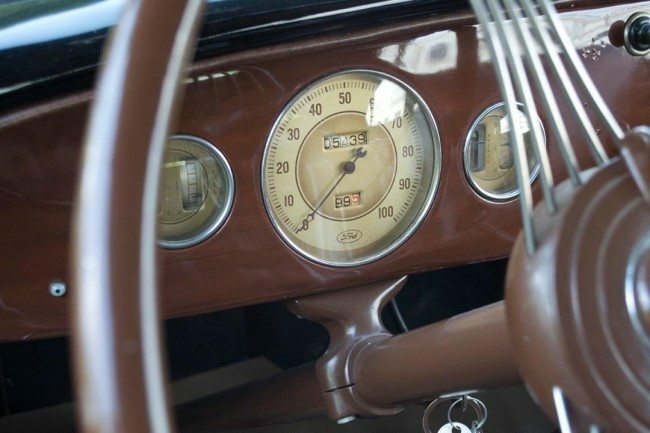 And in front of the driver, the classic banjo steering wheel frames a “V8” branded column. If you have a Ford Deluxe Phaeton or another collectible you’d like to insure with us, let us show you how we are more than just another collector vehicle insurance company. We want to protect your passion! Click below for an online quote, or give us a call at 800.678.5173.